A comforting, lightened-up Italian-inspired casserole made with fresh, high-quality ingredients from Alessi. 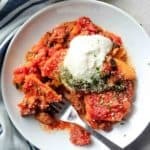 Make it in the Instant Pot or slow cooker for an easy, weeknight meal! Cook the sausage and veggies. If you’re using the Instant Pot, press the Sauté button and add the Alessi Olive Oil to the pot. Add in the sausage and cook until browned. Then, stir in the onion, garlic, zucchini, red bell pepper, and Alessi Tuscan Seasoning. Cook for a few minutes until the veggies have softened. Keep 1/3 of the sausage mixture in the Instant Pot and transfer the rest to a bowl. If you’re using the Slow Cooker: heat the oil in a large sauté pan over medium heat. Add in the sausage and cook until browned. Then, stir in the onion, garlic, zucchini, red bell pepper, and Alessi Tuscan Seasoning. Cook for a few minutes until the veggies have softened. Layer 1/3 of the sausage mixture on the bottom of a slow cooker. Layer: Over the sausage mixture, layer the following: 1/3 of the polenta rounds, a drizzle of pesto (1 tablespoon), and 1 cup sauce. Then, repeat with the sausage mixture, 1/3 of the polenta rounds, a drizzle of pesto (1 tablespoon), and 1 cup sauce. Finish with the final group of polenta rounds and 1 cup sauce. Cook the casserole. For the Instant Pot, press the manual button, and set the timer to cook on high pressure for 5 minutes. Naturally release pressure for 10 minutes. Remove the lid. If there is excess liquid pooling on the sides, press the Sauté button again and bring the excess liquid to a low simmer, cooking for an additional 5 minutes. This will allow the liquid to evaporate. For the Slow cooker, cook on high for 2-4 hours or on low for 4-6 hours. If there is excess liquid pooling on the sides, keep the slow cooker cooking and remove the cover for a half hour to let the liquid evaporate. Make the whipped ricotta: Add the ricotta, lemon juice, garlic puree, and a sprinkle of salt and pepper to a food processor. Process until ingredients reach a smooth texture. To serve: Spoon the casserole into bowls and top with whipped ricotta, parmesan, fresh parsley, and pesto. If your casserole is still a bit watery even after following the above instructions, it always helps to turn off the Instant Pot or slow cooker and just let the casserole rest for while. The sauce will thicken as it sits.